Patricia Hurley accepting hamper on behalf of their grandchild, Emma Hurley. Congratulations to Emma Hurley on being drawn in the raffle for our Easter hamper! Emma fundraised money on behalf of the centre and was drawn as the winner this morning. A massive thank you to all fundraisers and everyone who donated for this good cause. If you want to fundraise for Ballinasloe Cancer Support visit our fundraising page for more details, click here. For the latest news, follow us on our Facebook page and make sure to check out the rest of the website. If you have any queries about our services, please contact us, 090 9645574. Coral Leisure Ballinasloe held another Swimathon last Friday March 22nd 2019 in aid of Ballinasloe Cancer Support Centre. It was another successful event and a huge turnout from the Ballinasloe community. We’ll have further updates about the event and future events to come. A massive thank you to all participants and all donations and sponsors for the swimmers. 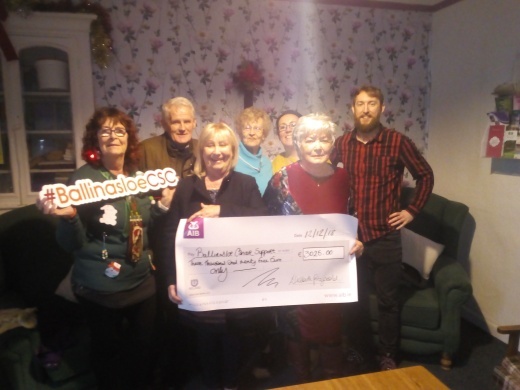 Our very own Elizabeth Fitzgerald held a coffee morning fundraiser before Christmas. It was a huge success raising €3025. A massive thank you to Elizabeth, everyone who attended the coffee morning and those who donated. On Monday we were presented with a cheque for €2700. A massive thank you to everyone who swam and everyone who donated and all who sponsored those to swim and finally to Coral Leisure Ballinasloe for organising the event. Coral Leisure Ballinasloe held a Swimathon last Friday 23rd November in aid of Ballinasloe Cancer Support Centre. It was a huge success raising over €2000 in donations. A massive thank you to everyone who swam and everyone who donated and all who sponsored those to swim. We are holding another Pop Up Shop starting from October 31st until November 3rd and open from 10am to 4.30pm. We are still accepting donations of goods for the shop and thank you all for your support! 100% of the money raised from the Pop Up Shop goes towards maintaining the centre which allows us to continue to offer practical and emotional support for people affected by cancer. Do you have goods that you would like to donate towards the shop? All goods can be left at our centre during opening hours. We won’t accept duvets, pillows or shoes. If you have any questions about the Pop Up Shop or any other queries, please contact us, 090 9645574.